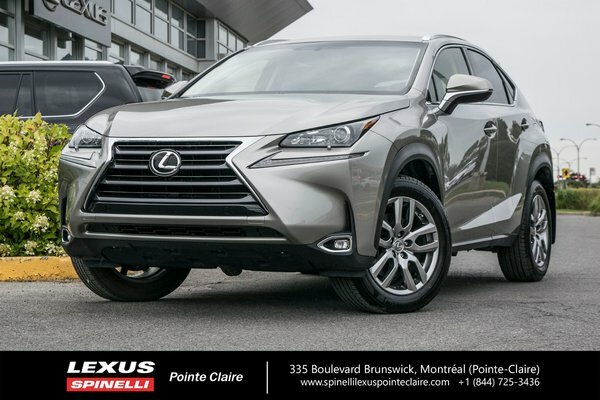 Don't miss out on your chance for this 2017 LEXUS NX200T with PREMIUM package. Only one owner that sold it directly to Spinelli Lexus Pointe-Claire as she was not doing much mileage. This beautiful luxury SUV has only 4328 kms!! Well equipped with power sunroof, dual zone A/C, heated and ventilated seats, leather interior, heated steering wheel, power tailgate and much more. Lexus warranty until June 27, 2023. However this is a CERTIFIED LEXUS vehicule with an additional 2 year/40 000 km Lexus powertrain warranty.. Never accidented. Carproof vehicle history report clean and without incident.